November is a month of mist and rain here. Mornings find the landscape wrapped in a gauzy blanket, through which the warm colours of the leaves cast a candle glow. The dew is heavy, and the tall grasses of the field are jeweled with silver-bright droplets. 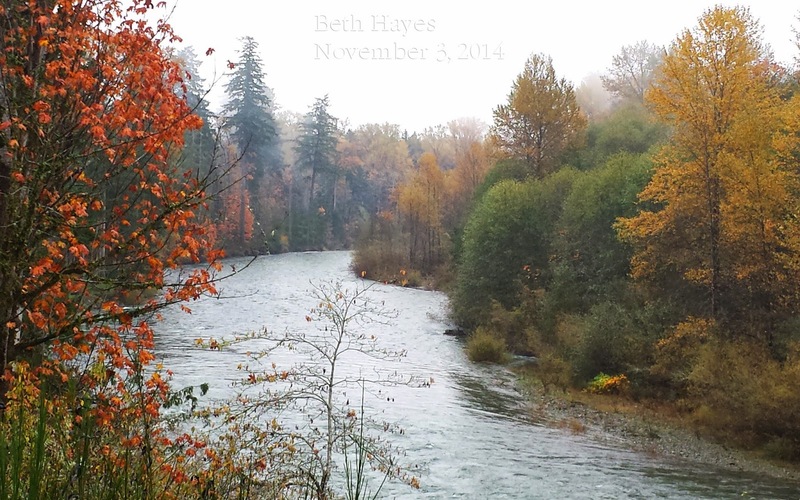 The rivers have risen, and salmon battle their way upstream to spawn. In the provincial park a short drive south of us, thousands of people come to watch their return, inspired by the timeless beauty of this seasonal migration. Here at home, First Nations fishermen line bridges over the river, casting their harpoons into the water to harvest this seasonal gift, a tradition dating back thousands of years. Eagles fish their fill too, and sometimes perch in their dozens in the trees along the bank. Small streams and rivulets form everywhere, coursing their chuckling way down the hills and across the walking trails where I hike. They form pools in low lying areas of the wood, their still mirrors reflecting the foliage around them. Frogs sing from their hidey-holes near the water; a last, sweet chorus before they cozy down to sleep through the winter months. As I walk, I fill my foraging basket. The mild fall has encouraged a whole new crop of young dandelion plants, whose leaves will find their way into my salad bowl tonight. Edible tree ear fungus decorate the trunks of alders and cottonwood. Bright red rosehips brighten the tips of throny branches along the edges of the trail. I return home with wet hair, muddy boots, chilled fingers, and a happy heart. Autumn is a gift. Whatever this November day brings you, I hope you find a quiet moment or two to unwrap and savour its gifts. Hold quiet in your hearts. Have a joyful day.